HomeLifestyleLifestyleIs the wedgie the new skinny jean? Levi have changed the denim game with their newly released jean-style, dubbed ‘The Wedgie’. The name, although strange, suits the style unequivocally. For anyone otherwise unaware, the Levi ‘Wedgie’ could be described as the love-child of a Mom Jean and the Levi 710 Super Skinny jean. This style could be the new skinny with its sculpting design, featuring close back pockets tilted inwards, in an effort to create a more uplifted, rounded posterior. These jeans bear resemblance to many other more vintage styles offered by the brand, with a high waist, which endeavours to hug your hips and create or flatter a feminine figure. This style could potentially suit all shapes and sizes, with its cropped length and frayed hems. This jean may be perfectly paired with a multitude of footwear, ranging from the reliable trainers you always revert back to, to court shoes, creating a more sophisticated look, or even tucked into a pair of Chelsea or lace-up boots. After all, our climate isn’t the most kind at times. Apparently Levi sought to launch a new and fresh style, influenced by various young celebrities. Famous faces, such as models Kendall Jenner and Gigi Hadid, have recently been spotted donning pairs of the brand’s most talked about denim, the classic 501 style. They’re often paired with Converse, turtleneck tops and chunky knits, as well as double denim, giving off a retro feel. I firmly believe that the Wedgie could easily replace those custom cut-off’s seen in their hundreds during festival season. For one, they’re more practical for the weather often bestowed upon ticketholders, easily tucked into wellies, while still looking effortlessly stylish, and don’t appear to possess the attributes of an often uncomfortable super skinny jean. 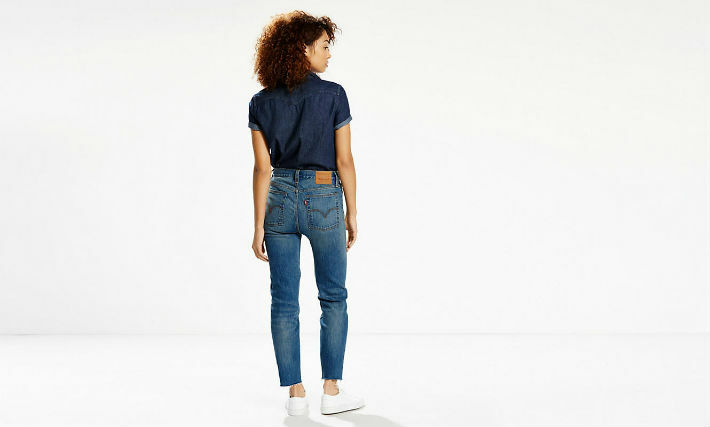 Although these jeans seek to live up to their namesake, a common classroom threat for youngsters, Levi claim that the jeans have little or no stretch, which begs the question as to how they may possible be so flattering towards one’s figure. In any case, the style is set to be adopted by those in the spotlight and surely those not in the spotlight also.